Garden tour season continues this weekend—I’ll be attending the Tangletown Garden Tour, which is a favorite among Twin Cities gardeners—but I’m still sorting through all the ideas from the other tours I have been on. Here are three more garden tour ideas worth stealing. Why buy cloches and other cages to cover plants that rabbits and other nibbling predators like when you can make your own? These cages were fashioned (and sold) by the Hennepin County Master Gardeners during their tour two weeks ago. 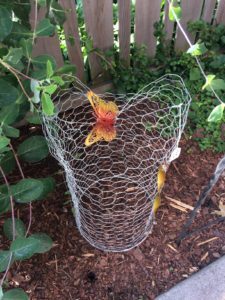 The master gardeners used chicken wire and a loop at the bottom to form a round cage. The butterfly clip at the top is a cute decoration and makes the cage look like garden art rather than rabbit barrier. 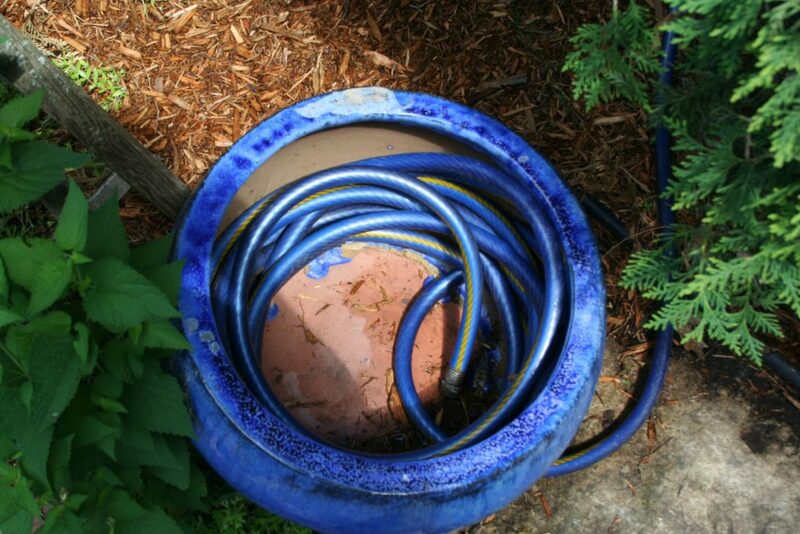 I’m not sure if the gardener who used this blue container to hold a blue hose bought the unit or made it, but it’s a great idea. Hoses are a garden essential, but often they are messy and easy to just leave laying around the yard for people to trip over. (Ahem, talking about myself there.) There is a hole in the bottom of the container that the hose travels through to connect with the water faucet. The bulk of the hose is wound up in the pretty pot when it’s not in use. The pot looks like garden decoration and adds a bright spot to the yard. Sun-loving plants are the perfect solution to a hot slope. This long slope garden was part of the Men’s and Women’s Garden Club of Minneapolis garden tour last weekend. 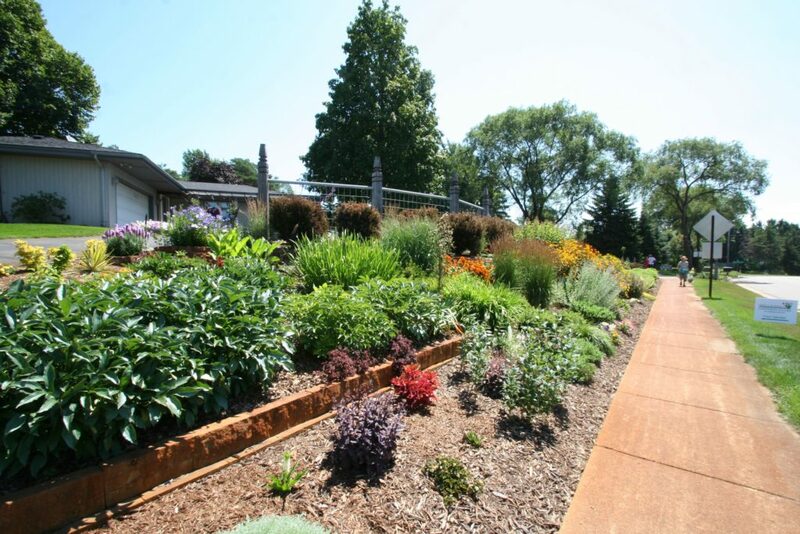 The gardener’s home faced a busy road and this long, west-facing slope was planted with sun-loving perennials. In early summer, it would be bright with peonies and irises. In July, black-eyed Susans provide a pop of yellow. In late summer, grasses and sedums would enhance the space, which is backed up with sun-loving shrubs (ninebark, I believe). What a great alternative to turf grass for pollinators and the gardener! Also, the garden added an attractive element to the road. 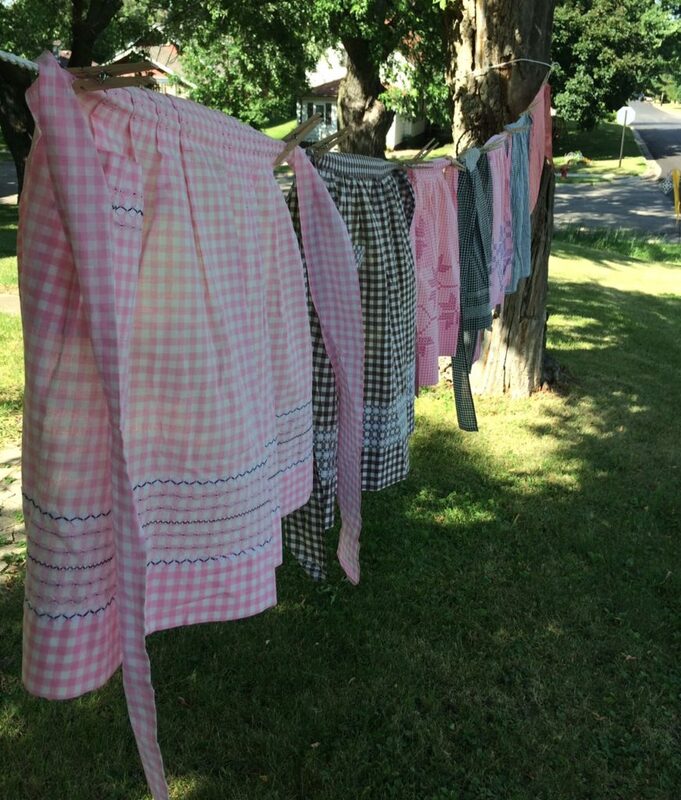 This isn’t a practical garden idea, but these antique aprons were part of the Tracy Area Garden Party a couple of weeks ago. They are from a collection of antique aprons and added a whimsical touch to the garden where they were displayed. The aprons were very pretty and all hand sewn. I wonder what ideas I’ll come across during this weekend’s tour?